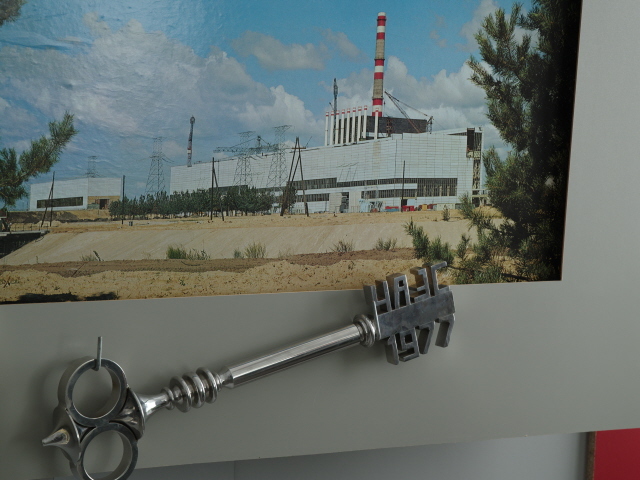 A small but quite fascinating local/regional museum in the small northern Ukrainian town of Slavutych – the place that was built to replace Pripyat as the home of the Chernobyl NPP staff after the 1986 Chernobyl disaster. 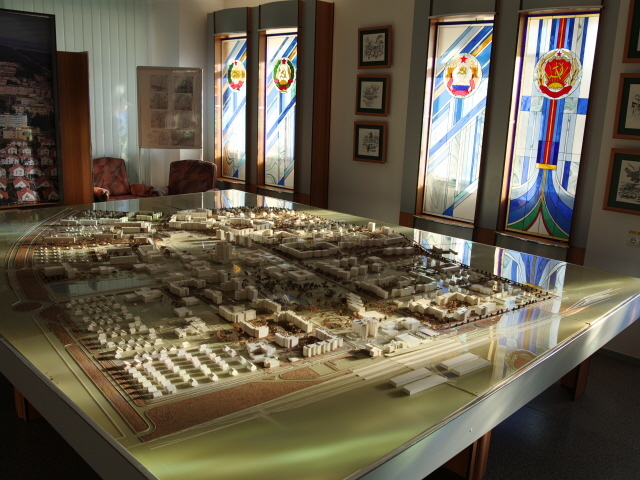 Naturally, the museum focuses on Chernobyl, the disaster and the aftermath but also on the construction of the town of Slavutych itself. More background info: See under Slavutych and Chernobyl, especially the NPP. When this museum came into being I cannot say exactly, but it is obvious that it must date back to Soviet times, given the stained-glass windows with Soviet symbolism upstairs and all that. How much it may have changed since the independence of Ukraine is also difficult to say. My guess is not very much. 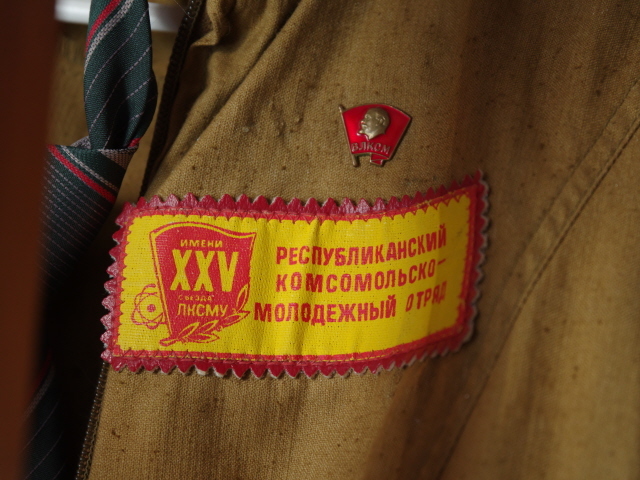 So it's also a bit of back-to-the-USSR “time travel” that's involved here. That also applies to the fact that foreign visitors touring this museum with a guide are accompanied not only by the local guide, but no: at least two other museum employees (presumably) followed our little entourage around all the way, semi-hiding in corners or behind columns, but ever present. Ah, the nostalgia! What there is to see: This is a museum that is lovably old-school in many ways. 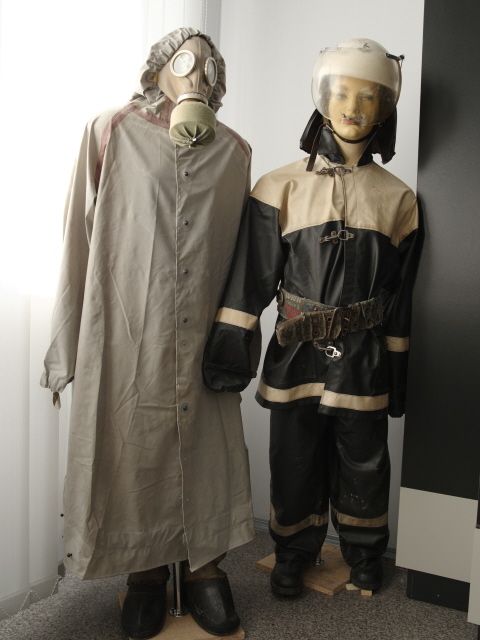 But it has many fascinating displays for those interested in the topic of Chernobyl. 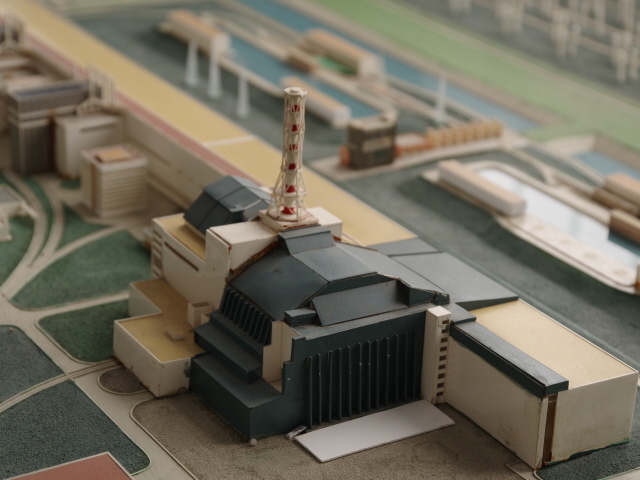 It is, however, very, very different from the larger but in parts overly dramatized (and occasionally a bit garish and kitschy) National Chernobyl Museum in Kiev. This is a much more sober and down-to-earth affair. When I visited the museum it was with a Chernobyl guide from Kiev who had organized this for me as part of the multi-day package. When we got to the museum, a local guide was called into action, a somewhat nervous woman, who clearly wasn't all that sure about foreign visitors coming here but did her best to accommodate us. As she didn't speak any (or at least not enough) English, my Chernobyl guide acted as interpreter. This went very well, but it was a rather formal affair that way. 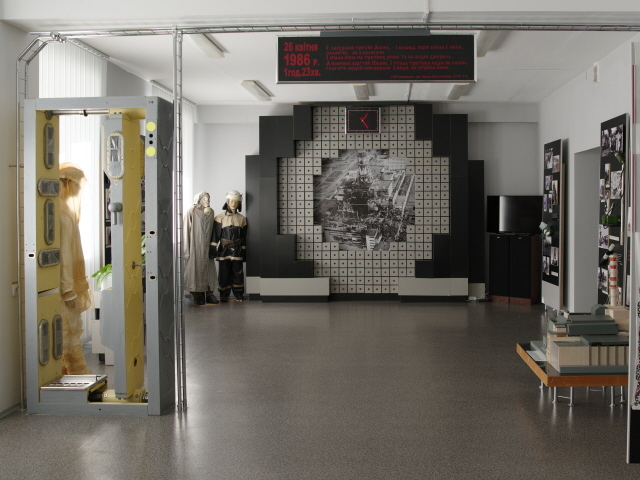 Thematically, the museum starts off with the construction of the first block of the Chernobyl NPP, Block 1, which went online in 1977. 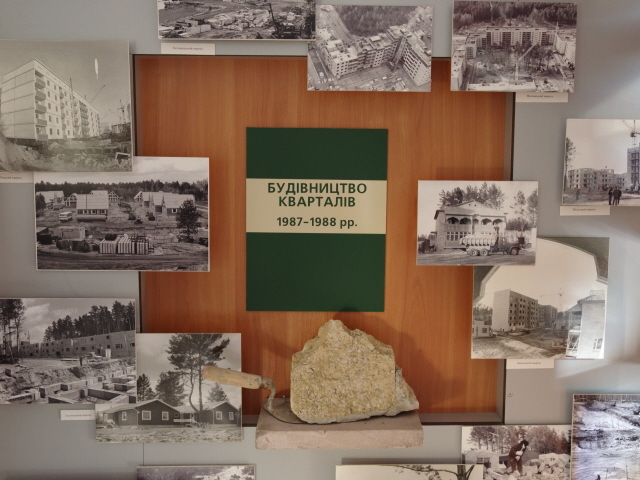 One display featured a huge symbolic key, some diplomas, plaques and photos of smiling people in a happy newly built Pripyat. 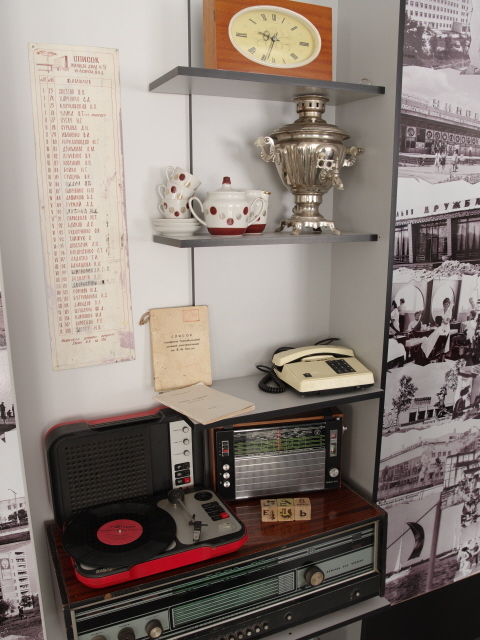 Also featured in the section about Pripyat were several household items that exuded a distinct Soviet-retro aura – from an old radio, turntable, decorative clock and – obviously – a silver samovar. 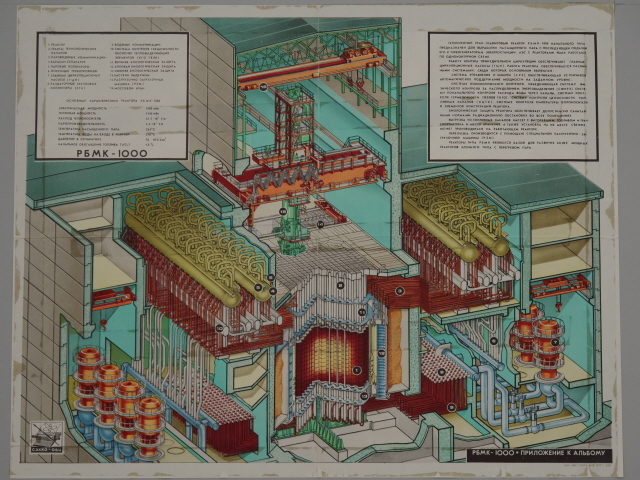 It then got a bit more technical, as the inner workings of Chernobyl's RBMK-1000 reactors were explained (see under Chernobyl NPP). 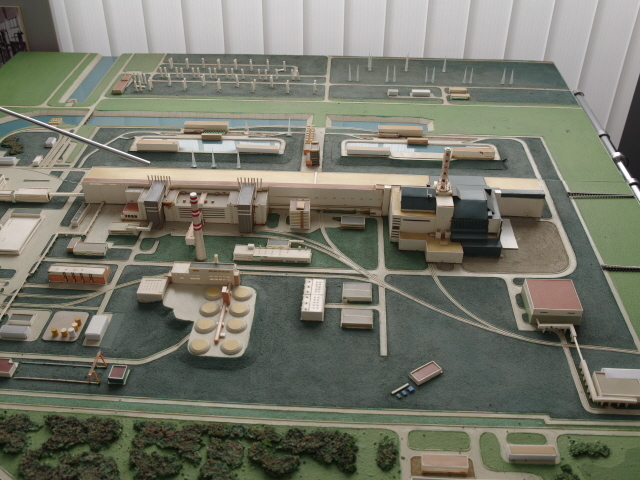 There's also a nice scale model of the whole NPP complex – already with the old sarcophagus over Block 4 – so as it looked from late 1986. A main section is obviously about that fateful day of 26 April 1986 when Block 4 blew up, and even more about the massive clean-up operation afterwards. The sombre atmosphere here, I thought, is somewhat undermined by the mannequins in protective suits, some of whom even have lipstick on! 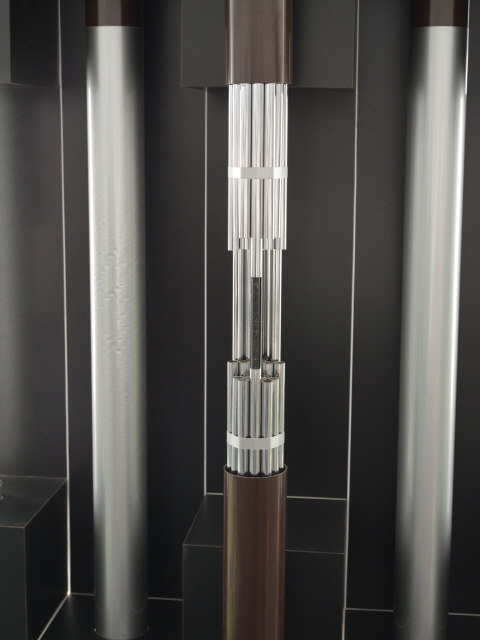 Beneath a wall with photos, documents and a few artefacts relating to the aftermath of the disaster is also another model of the destroyed reactor core. This one a larger scale and apparently dismantle-able to let you see the inside of the sarcophagus. 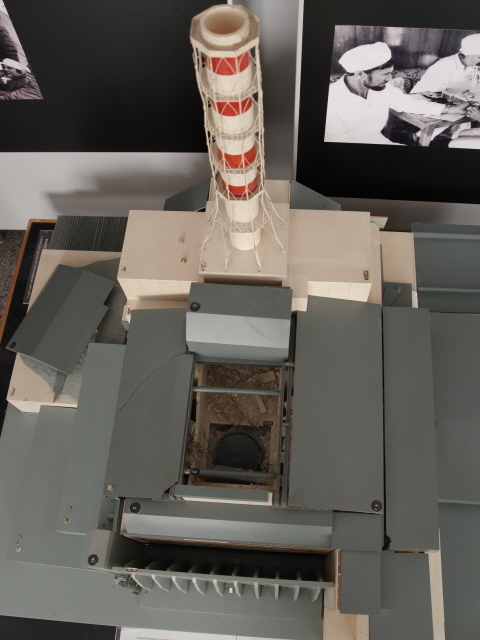 But I only caught a glimpse of the reactor core lid through a hole in the roof, the guide did not demonstrate the workings of this model. Instead we were led into the central shrine – a chapel-like space dedicated to those who died in the immediate aftermath of the disaster and the initial response to it. 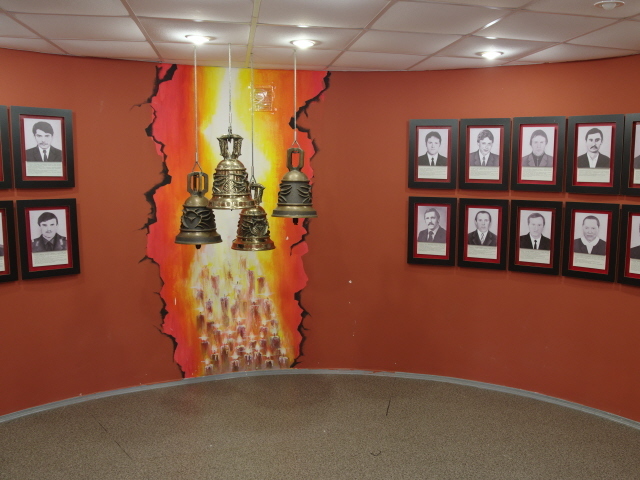 Some 30 portraits each with names and a short explanation of their role in the disaster flank a central image of candles burning into a single flame behind four bells hanging from the ceiling. (cf. the Chernobyl monument in Slavutych that has the same portrait photos). At the end of the exhibition is a section about the May Day celebrations in Kiev in 1986 – held despite the disaster and before the inhabitants were even informed of it – as well as the trials against those found responsible for the disaster. By the exit is a whiteboard where visitors can leave a remark (instead of in a guest book), and I dutifully added something about how Slavutych is such a nice replacement for Pripyat or so. We then headed upstairs where there is a separate exhibition about Slavutych and how it was constructed. 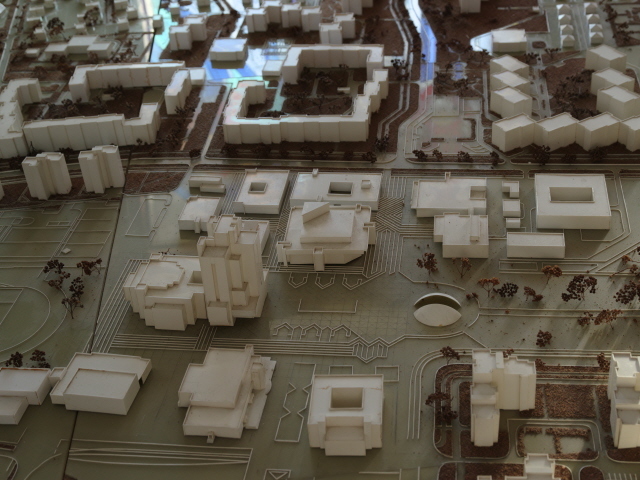 The central exhibit here is a large architect's model of the whole town, with white houses, including even a tall one in the centre that was never actually built. 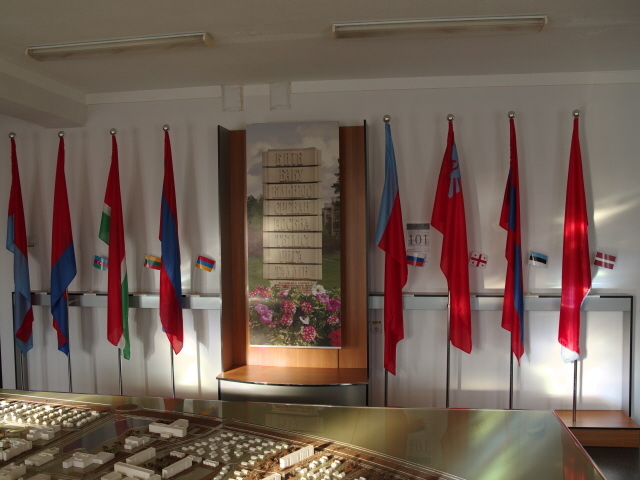 The rest of this section explains how construction workers and materials were brought in from eight different Soviet republics (see under Slavutych) and their flags are proudly displayed on the one wall (accompanied by smaller flags of the independent states that all these republics became after the collapse of the USSR). 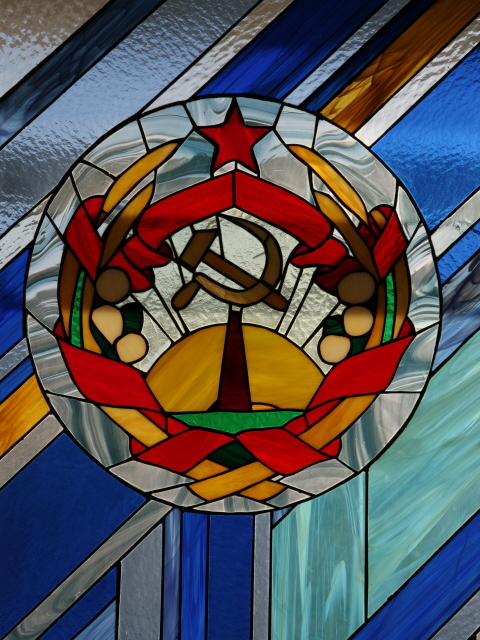 The windows are true Soviet relics – with stained-glass renditions of the various republics' coats of arms. 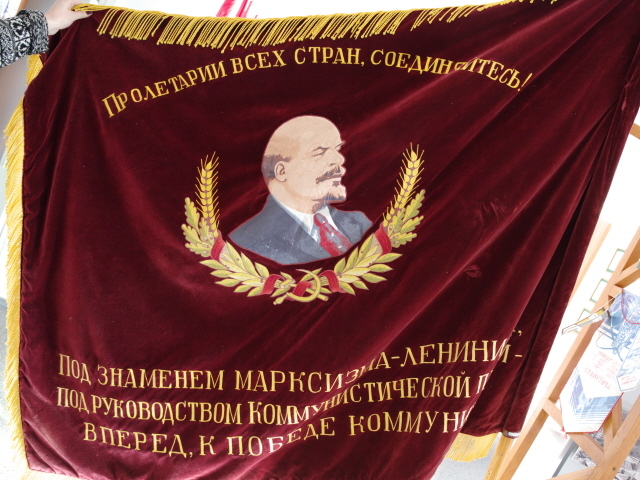 Other Soviet memorabilia are the big red velvet flags/banners, one with the image of Lenin on it. Outside this museum, so it was pointed out, the display of such items would now be illegal (due to a new law introduced in Ukraine a few months earlier). 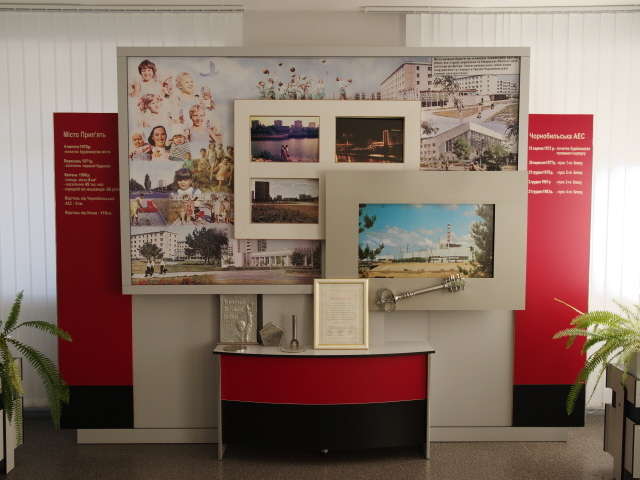 The museum would have had even more sections, but these we bypassed and they were left in the dark – lights are only switched on for visitors entering rooms and switched off again as soon as they leave (a custom I also remember from other Soviet museums … and from North Korea!). I couldn't really make out what these other sections would have been about, but I think I spotted some taxidermy in the back, so I presume they would have covered topics such as the local flora & fauna and such typical regional museum stuff. 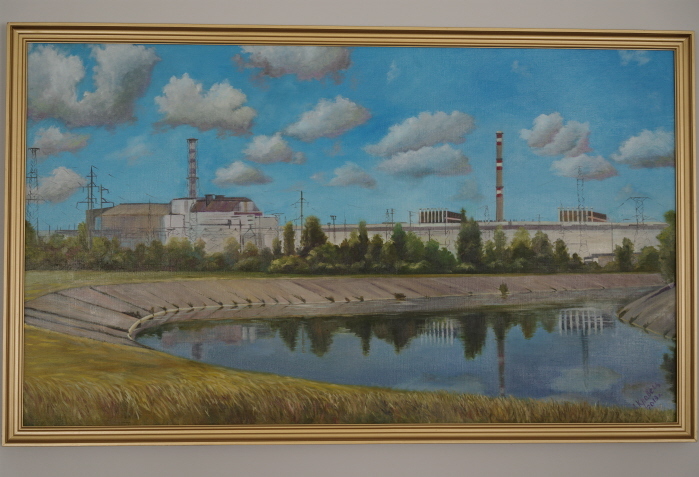 All in all I found this museum a worthwhile add-on to my trip to Chernobyl via Slavutych. 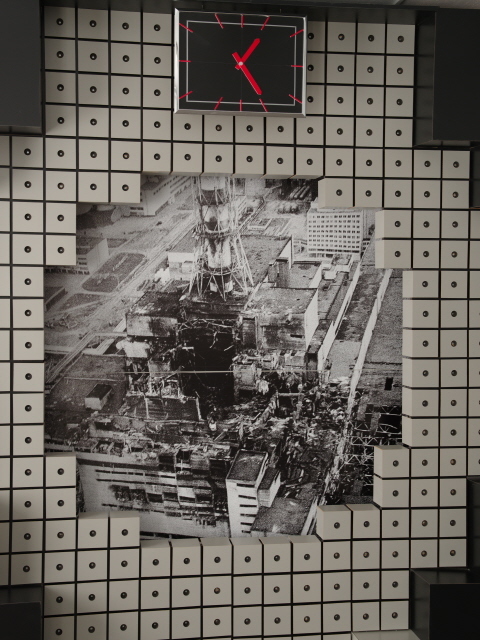 It may be a bit “retro” in its design, and the guided tour was a little stiff, but there were still a lot of interesting details in addition to what I already knew about the story of Chernobyl and the disaster. Location: right in the heart of Slavutych, Ukraine, to the east of the middle of the central square, at 7 Prospekt Druzhby Narodiv. Access and costs: easy enough when part of a larger guided tour, but unclear how easy it would be independently (or how much it might cost). Details: The museum is easy enough to get to when staying in Slavutych, it's just a short walk north from the hotel on the edge of the central square. When I visited the museum it was as part of a larger Chernobyl tour package, and my guide both drove me there and accompanied me on the guided tour he'd arranged with a local museum guide. As she only spoke Ukrainian, my Chernobyl guide (very capably) doubled up as an interpreter. What the experience would be like if you turned up there independently I really cannot say. I could well imagine that it could cause a bit of a confused scene – unless you speak Ukrainian well enough to pass as a compatriot. Opening times: weekdays only, from at least 10 a.m. to at least 4 p.m., but I've also found longer times online (e.g. 9-18h). But it's all irrelevant if your guide has organized the visit with a guided tour anyway. Admission: I have no idea, to be honest. When I went it was included in the overall tour price anyway, and I guess that if you can/want to visit it independently it can't cost all that much in a place as off the beaten track as Slavutych. Time required: our tour took a good hour – but if you went independently and can read Russian/Ukrainian then you could possibly spend longer in here. Combinations with other dark destinations: See Slavutych. Combinations with non-dark destinations: See Slavutych.